A number of children became "trapped" under a railway carriage after a miniature train ride in a Watford park derailed, eyewitnesses have said. The crash happened at Cassiobury Park on Tuesday afternoon. Jeff Price, who owns the railway, said one woman was taken by her family to hospital for a cut on the head and there were a number of "grazed knees". Watford Borough Council said no-one was seriously hurt, but the Health and Safety Executive had been informed. Daniel Reichmann, 26, from Edgware, who was on the train with about 10 other family members, said five minutes into the ride there was "a bang and a crash and a jolt". 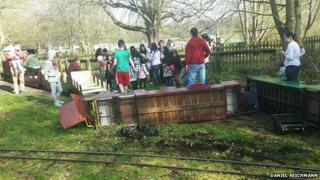 He said there were "a number of screams" as one of the carriages derailed and the others behind crashed into it. Mr Reichmann, a volunteer paramedic and part of the Reichmann family who built Canary Wharf in London, said: "About two or three children were trapped under one of the carriages, but we managed to lift it off. One or two people were thrown out of the carriage. "There was a lot of screaming, but I assessed the children and there were no broken bones or serious injuries. "The driver was clearly shocked and immediately offered to refund the ride." Mr Price said the problem occurred with a faulty spring on one of the carriages, which has since been removed from service. He said other matters were being dealt with to "mitigate any future risk". Watford Borough Council, which owns the park but leases the railway to Mr Price, said: "Nobody was seriously injured and the ambulance service was not called to the area. "The children's train operator will be submitting a report, setting out what has happened to the Health and Safety Executive and they will determine if further investigation and action is needed."